Step into the tropics by enjoying a sweet juicy papaya. A papaya resembles a melon on the inside, but it is botanically a berry. It has a green to yellow outer skin but is orange to pink on the inside. The cavity is filled with black, edible seeds with a peppery taste. Papaya is native to Mexico and Southern America, and may be found in the early summer and fall. Most of the papayas sold in the U.S. are imported but they may be found growing in Hawaii, Florida, California and Texas. Papayas should be stored at room temperature until ripe. Once ripe, they can be refrigerated for up to three days. To prepare a papaya, peel the skin with a vegetable peeler. Slice the fruit in half with a large knife, and use a spoon to scoop out the seeds. The flesh can then be cubed and eaten as is or turned into a delicious dish. Fresh papayas contain an enzyme called papain, which breaks down protein. Therefore, fresh papaya should never go into a gelatin dish, as it will not set. Luckily, heat destroys this enzyme so canned or cooked papaya works fine with gelatin. 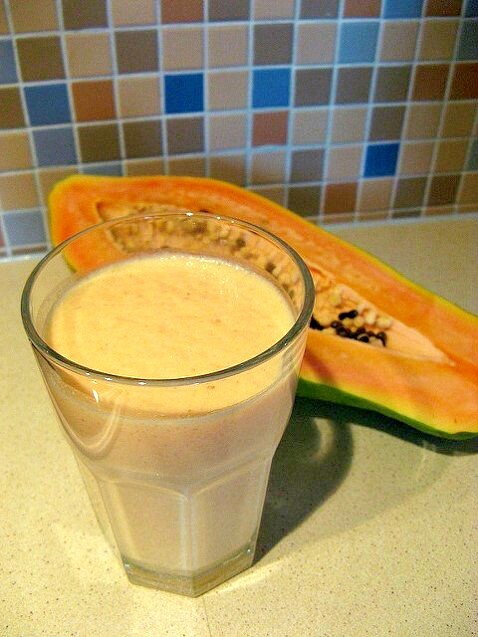 Use papaya in fruit salads, salsas and smoothies. Papaya is delicious on it's own but can also be sprinkled with a squeeze of lime juice for an ultimate marriage between the two fruits. Try it dehydrated in granola or trail mix. Papaya may also be popular in Thai cuisine. Cook papaya with onions and coconut milk and season with curry and other spices for a sweet and savory sauce served over a bed of vegetables and rice. And although they may not look like they belong, the seeds can used over salads or anywhere in place of black peppercorns. Expand your fruit repertoire with papaya! Combine all ingredients in a blender and puree until creamy and smooth. Enjoy immediately. Store leftovers covered in the refrigerator for 24 hours, or freeze into ice pops for long-term storage.